Northern Arizona University (NAU) has experienced significant growth over the past 10 years. Founded in 1899 in Flagstaﬀ, Arizona, which recently ranked fourth on USA Today’s Best Small College Towns list, the student-first university has nearly doubled its number of students in the past decade to more than 21,000 on the ﬂagship campus. A growth story is excellent for admissions and student life but can be challenging for one department in particular: Facility Services. Director of operations Scott Perelstein, who has been with NAU for nine years, explained the growth in population has caused more construction, new buildings and a need to adapt to serving more people in these new and existing spaces. 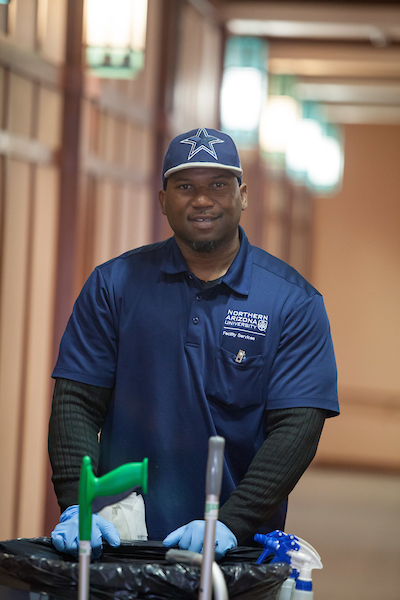 The 120 full-time custodial staﬀ that supports cleaning across campus needed to change their approach to become more efficient at keeping the whole campus looking its best. Improving the cleanliness of the environment was also a key priority for university President Rita Cheng, who wanted to see quick changes in the quality of cleanliness. To solve this challenge, the facility services team chose a team cleaning. Implementing team cleaning at NAU required a significant cultural shift in addition to changes in processes and procedures. Many custodians have been working at the university for 30+ years and “didn’t know what they didn’t know,” Perelstein explained. To ensure the necessary changes would be lasting and successful, NAU officials realized they would need outside help. Tim Poskin of Cleaning Management Concepts was with them through every stage of the process. Cleaning Management Concepts uses a seven-step process to achieve Cleaning Change Solutions™. The first step is an initial assessment to understand where you stand. Poskin introduced the team to the benefits of re-tooling with Unger Enterprises. Poskin described the team as “passionately frustrated” when he arrived, wanting to improve but not knowing how. Until now, NAU’s solution consisted of generalist cleaners assigned to specific building or ﬂoors completing a variety of tasks, including ﬂoor cleaning, dusting, vacuuming and restroom care. Custodians could be assigned to multiple buildings located throughout campus or be responsible for a section of a building where other custodians were already working. The process was inefficient and exhausting and lacked a holistic approach to assignments. Cleaning tools were another challenge. Custodians were equipped with dated string mops, cotton rags and cumbersome carts that often didn’t fit through doorways or accommodate tools. The availability and condition of mop buckets and other tools varied depending on the building. Best practices for cleaning didn’t exist. With NAU being the largest employer in Flagstaﬀ, the university didn’t have any examples to look to in managing such a large task. 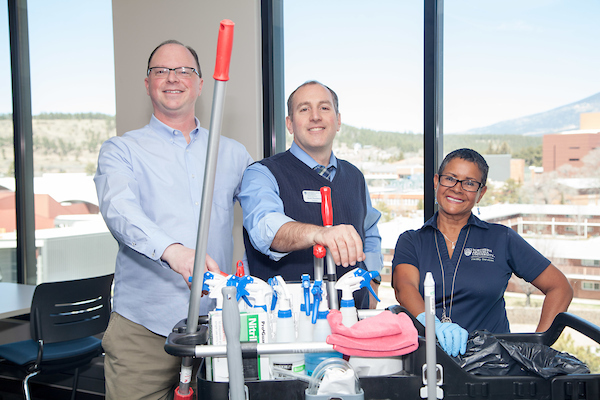 By bringing in the team from Cleaning Management Concepts and tools and equipment from Unger Enterprises for outside support, NAU adapted its disjointed and inconsistent cleaning process to a team cleaning approach. 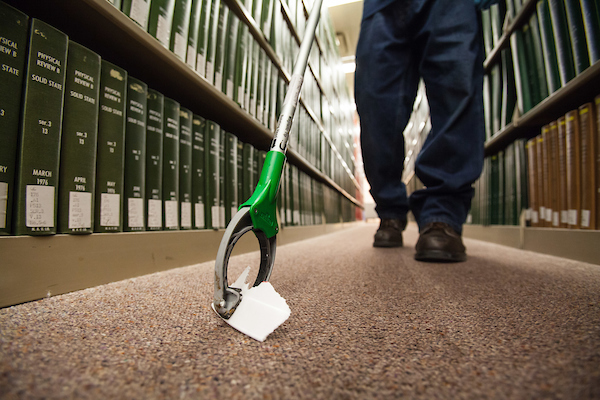 Part of the cleaning transformation included ditching NAU’s old mops, cumbersome carts and varying mop buckets in favor of the Unger RestroomRx, an all-in-one system designed for custodians, by custodians. The system provides a cleaning cart with vinyl trash bags, all tool clips and holders, a 32- or 16-quart dual bucket system, mop holder, color-coded Micro Mop 15.0, telescopic dustpan, NiftyNabber®, swivel brush, toilet bowl brush and duster so custodians have everything they need at the beginning of their shift. The process of moving from a system of individuals working alone in isolated settings to working together as a team of specialists to drive change and efficiency had a huge impact. There are now four types of specialists, each focusing on a singular task such as a restroom specialist. The specialist now handles all of the restrooms over a large area while no longer having to cover dusting and vacuuming in non-restroom areas. The roles work in a domino fashion with each job impacting the next, perpetuating building accountability and creating a true team mentality while increasing efficiency. Tasks have been adjusted to prevent team members from following the exact same process every day. Some days focus on deep cleaning while others focus on lighter spot cleaning, allowing for more variety and project work opportunities. Perelstein hopes the ﬂexible schedule will help with absenteeism and keep custodians engaged, leading to minimal intervention from supervisors. Training is critical to successful implementation. The first training involved meeting with custodians to introduce them to the new approach and set the stage for the culture shift. All team members went through two days of custodial cleaning specialist skills training on the processes, learning Level 1 skills and sampling new tools. Start-up of the new team began the day after the cleaning workers graduated from class with the team regrouping 30 days later to discuss what worked and what needed to be tweaked. Level 2 training was rolled out after 60-90 days, focusing on the project work and less frequent tasks. The new tools were a hit at the training. When the Unger RestroomRx was rolled out for the first time during boot camp, custodian Dennis Gant, who has been with NAU since December 2017, stood up in the middle of the discussion and began walking around the cart in awe, describing it as a cart that “makes you want to tuck your shirt in.” In addition to the tools and training, the support of the administration has been critical to success. Poskin explains that while he usually works with universities at the director level, it was unique to have everyone from the president all the way down to the custodians engaged in the process. The team cleaning rollout began in July 2017 and is approximately 75 percent complete, with one phase left to complete the transition in academic buildings. The full program will be rolled out across all 119 buildings on 5.6 million square feet of the campus and eventually will extend to residential buildings. Unger’s RestroomRx carts are being used in all restrooms and eventually will be located in all 119 buildings. Currently 50 buildings have the carts. Another gauge of success has been the feedback from all levels of the organization, from President Cheng and the administration to the vice president of capital planning and campus operations to the facility services team and building managers. “Those building managers who have it are bragging about it and those who don’t are pining for it,” Perelstein said. The highest-performing custodians are the most enthusiastic and see it as “being part of something bigger than themselves” and something they can be proud of, he adds. Next on the cleaning plan for NAU will be the completion of the academic building phase and then to evaluate the residential building rollout. The team has learned a lot since kicking oﬀ the team cleaning process, but it’s clear the learning won’t stop when the implementation is complete. “Cleaning is an ongoing process and will continue to evolve as our campus evolves. We’re at the beginning of our clean trajectory and are excited to see the results that come next,” Perelstein added. 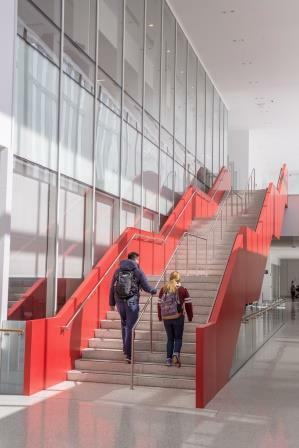 The Building Services team at the University of Maryland doesn’t hesitate when asked their goal: They exist to support the mission of the university to “provide excellence in teaching, research, and service” by providing a healthy and safe environment for learning. 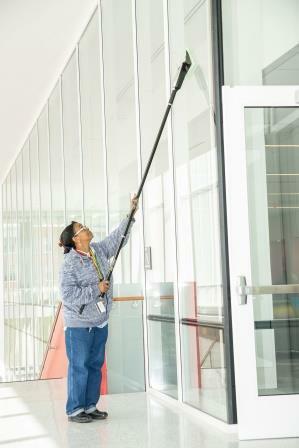 This is no small task: the team is responsible for 94 buildings, 5.4+ million square feet, 550 classrooms and lecture halls and 921 restrooms that include more than 4,600 fixtures, all of which must be cleaned and disinfected daily by a staff of 187 housekeepers. The University of Maryland has a strong academic and research reputation and was recently ranked #22 among top public national universities and #50 in best global universities by U.S. News & World Report (2018). The University also receives honors for its clean environment, having recently been GS-42 recertified, the Green Seal Standard for Commercial and Institutional Cleaning Services. As 30-year University of Maryland veteran and Executive Director for Building and Landscape Maintenance Harry Teabout III puts it: “We have always strived to be world class.” This is evident in the University’s approach to cleaning and facility maintenance. 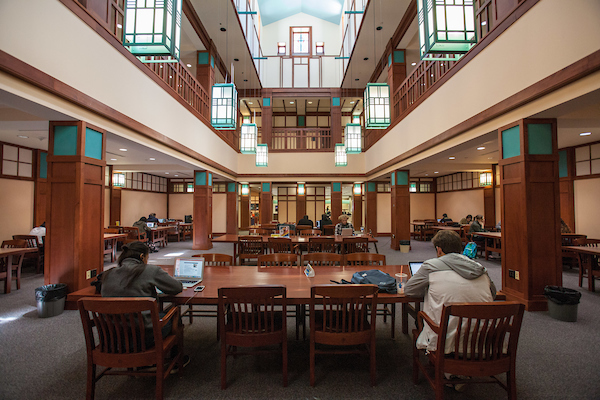 Similar to other universities and organizations over the years, the University of Maryland has been faced with budget reductions which resulted in the need to increase efficiency and productivity. For the Building Services team, this meant doing more with less following a team headcount reduction of 100 full-time employees. The team needed to find a way to do things faster while maintaining its extremely high quality standards. They found the answer in a “team cleaning” approach with the help of Unger Enterprises, Buckley and Associates and Daycon Products Co., Inc., the University’s industrial distributor. That approach, which has been in place for many years, continues to pay off in terms of helping the university achieve more quality cleaning results in less time. Before team cleaning, the University had no standardization across cleaning products and procedures and no synergies among cleaning products. In addition, they were dealing with eight to 12 vendors, which resulted in a broad range of disconnected products across the campus and a lot of headaches for the Purchasing department, which was spending 30 percent of its time buying cleaning products. Building Services realized that moving to one contract could save them thousands of hours while also giving them the consistency and standardization they lacked. “This was an ‘aha moment’ when the team realized that we could partner with Procurement and articulate our Vendor Managed Inventory (VMI) and floor care needs and move from bidding on individual products to bidding holistically,” explains Keith Gurley of Daycon Products Co., Inc..
With the move to one contract, the University of Maryland brought in long-time cleaning partner Unger Enterprises to standardize their processes, procedures and products. It all started in the restrooms, which is a critical area for cleaning and an area where the most intensive training is needed for dealing with chemicals and bodily fluids. “Restrooms are an area where the most complaints arise, but can also be an area of opportunity to showcase the cleanliness and health of an entire organization,” said John Lombardo, Vice President of Global Marketing for Unger Enterprises. The University of Maryland began using Unger’s RestroomRX in the summer of 2017 and now have approximately 100 of these restroom work stations across the campus. 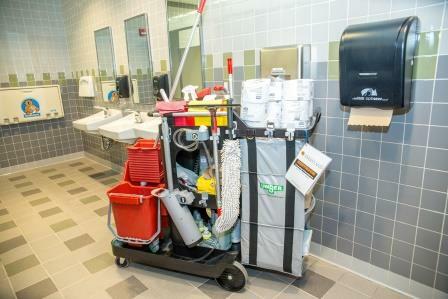 The RestroomRX includes everything in one system – a Cleaning Cart (including vinyl trash bag, all tool clips and holders), 32-quart or 16-quart dual bucket system, mop holder, color-coded Micro Mop 15.0, telescopic dustpan, NiftyNabber®, swivel brush, toilet bowl brush, and duster – so that custodians have everything they need at the beginning of their shift. Safety – The Ergo Rail eliminates poor posture and allows custodians to maneuver the cart in and out of restroom entrances quicker and easier. A patented clip system ensures all tools have an identified position on the cart and are securely in place while moving down the hall. Custodians do not have to bend or reach to get tools from the cart. Efficiency – The Storage Module substantially limits trips to a supply closet to restock supplies, which increases productivity. The patent pending Narrow Tool Tower design allows all tools to remain within the boundaries of the cart. Cleanliness – Tools in the system, such as the Dual Bucket, Telescopic Dustpan and patent pending Drip Tray, are designed to deliver optimal productivity and cleaning results. “This is one of the best products I have seen for getting a true clean and has increased our standard of cleaning across the campus,” said Byron Coleman, Operations Manager, Building Services. Beyond the system itself, key to the success of the RestroomRX is that Unger didn’t just deliver the tools but also the processes to standardize the cleaning approach. Prior to team cleaning and RestroomRX, the University of Maryland used a zone cleaning approach in which every cleaner cleaned in their own way. With the Unger system, restroom cleaning is now a structured process with standardized tools and best practices, and the University conducts training every month to ensure compliance. “This approach allows every employee to be better than average,” said Coleman. In addition to improving cleanliness, the RestroomRX system brought the University “consistency across the campus so that every customer walking into any of our buildings knew exactly what to expect,” added Sheryl Shamblee-Carter, Zone Supervisor. Final Graders Are In: A+! Perhaps the most impressive result of the University of Maryland’s cleaning program is that despite losing 100 full-time employees from the custodial staff, the University experienced no decrease in the quality of cleanliness – a tribute to the efficiency and productivity gains of the Unger solutions and the Building Services team’s dedication. A third-party study done annually by Sightlines backs this up, consistently rating the University of Maryland with top inspection scores in the housekeeping area. The most recent survey results show that the University of Maryland’s inspection ratings exceed their Big Ten Schools peers’ average. The GS-42 re-certification, which helps with recruitment, is another proof point that the program is working. The University of Maryland was the first public university and the second among all universities in the country to be awarded the certification. The University reviews all of the products it purchases each month from a sustainability standpoint, and 82 percent are consistently scoring higher than the standard every month across all 94 campus buildings. The housekeeping staff are among the biggest fans of the new cleaning system. Unger is providing them with the tools and processes to help them do their jobs more safely and efficiently. Over the past 5 years, the Building Services Department has seen a significant reduction in work process/ergonomic injuries. “Prospective students and their families may not recall all of the specifics of the academic programs we offer after they visit, but they will remember what the campus looked like and the feeling of whether they want their child living here,” added Teabout. In other words: You never get a second chance to make a first impression. The University also plans to soon begin testing of the Unger Excella™ Floor Cleaning System, a flat mopping system with microfiber technology that improves ergonomics, efficiency and worker safety. A key differentiator of the Excella when compared to other flat mops is that the Excella handles all floor care needs – including damp mopping, wet mopping, dusting and finishing – in one single solution. Custodial staff can use the Excella for a variety of applications ranging from small spot cleaning to medium-sized rooms to large surface areas such as gymnasiums and cafeterias. In building services and looking for similar results? Contact us today! Bridgeport, Conn April 2, 2018 – Unger Enterprises is proud to announce the launch of the Unger Excella™ floor cleaning system. Unger Excella has been independently verified to clean and seal floors twice as fast as traditional methods. “At Unger, our focus is making tools that get the job done faster and keep employees safer. Unger Excella has a unique design that allows users to use the latest technology and cut labor time in half” offered John Lombardo, VP Global Sales and Marketing for Unger. “The patent pending elements of the Unger Excella all but eliminate strain and stress on the user and keep them moving at top speed. The Unger Excella™ is suitable for use on all hard floor surfaces and for spot mopping, wet mopping, dusting and floor finishing applications. 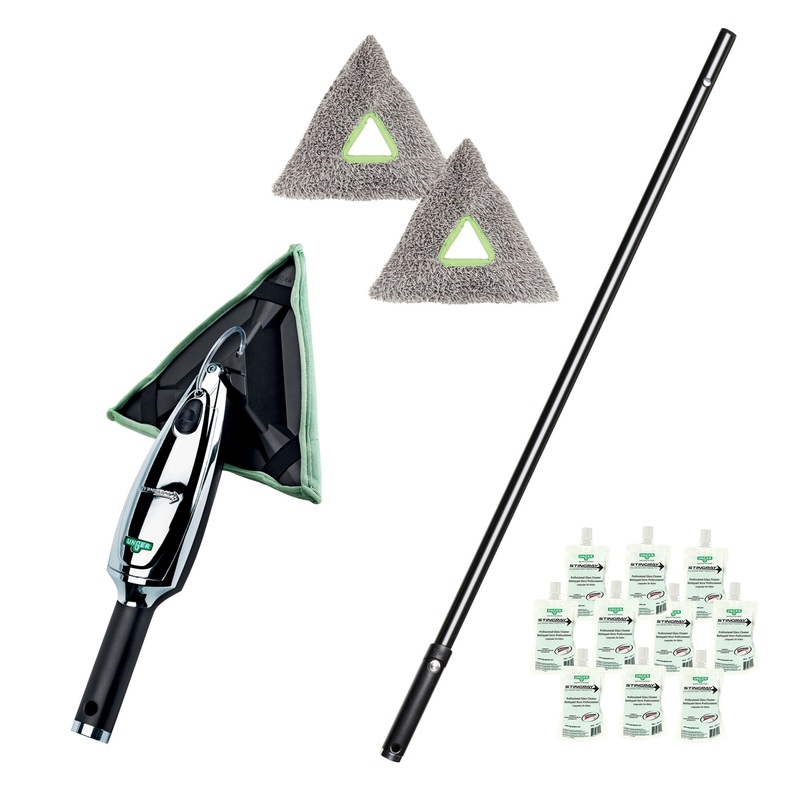 A .5L bottle, 1L bottle and 5L backpack allows you to scale your floor cleaning to match the environment. Create a new condition for success. Providing a string mop, a roll of paper towels and spray bottle of glass cleaner is not enough for a cleaning worker to do a sufficient cleaning job. 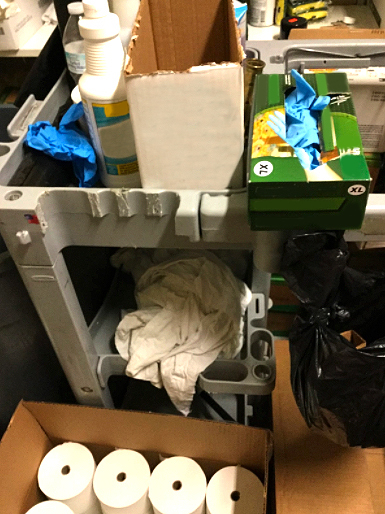 Even worse, many carts evolve over time to include an assortment of off the shelf products which were added as they were needed, creating a safety hazard to the cleaning worker that is required to have proper SDS onsite. Overloading restroom cleaning carts is ineffective as well. Tools, equipment and chemicals not designed for restrooms create levels of unnecessary complexity and cost to daily procedures. Do either of these scenarios sound familiar? You’re not alone. Many organizations are in search of a better way that creates a condition for bathroom cleaning success. The answer is specificity. Specificity allows the cleaning worker to utilize a precise set of tools and equipment that are connected to a very precise list of tasks and materials that are easy to understand and implement. A hodgepodge cart full of misc. materials is efficient, costly, and unsanitary. Utilizing task-designed tools in a color-coded system simplifies and enhances the cleaning process, allowing the cleaner to properly and effectively sanitize the area. Implementing the appropriate right tools, equipment, and cleaning chemicals positions your cleaner, and your facility, for success. Need help finding the right tools? Learn more here. Bridgeport, CT September 7, 2017 – As a proud sponsor of Healthy Schools Campaign’s (HSC) Green Clean Schools program, we’re helping more and more schools and universities support student health and wellness through green cleaning. And HSC’s Green Clean Schools Track at ISSA/INTERCLEANⓇ North America, September 11-12, 2017, will bring green cleaning to the forefront of hundreds of school and university cleaning programs. Over the past 10 years, HSC’s Green Clean Schools has promoted green cleaning in schools through online resources, events, webinars, education and advocacy. This year the Green Clean Schools Track, hosted by Healthy Schools Campaign and ISSA (the worldwide trade association for the cleaning industry), will be the official education seminar package at ISSA/INTERCLEAN. The event will bring together leading university facility operators to raise awareness about green cleaning best practices, products and trends that will help them elevate their cleaning programs to new heights. From making data-driven decisions, to selecting green products and equipment, to hands-on demos of the latest technology in the cleaning industry, the Green Clean Schools Forum is designed to change how schools are cleaned—with health and the environment top of mind. In addition to learning green cleaning best practices from leading education facility directors, this unique two-day event offers built-in networking events as well guided tours of the trade show floor. The workshops, led by members of the Green Clean Schools Leadership Council, are based on Healthy Schools Campaign’s 5 Steps to Green Cleaning in Schools. We are proud to be a part of this important work. As a sponsor of Green Clean Schools, Unger Enterprises is dedicated to enhancing our green cleaning work and enabling school environments to support student health and wellness. And we couldn’t be more excited about the Green Clean Schools Track at ISSA/INTERCLEAN, which opens up the cleaning industry’s biggest trade show to school and university facility operators. Learn more about the event, including how to register, at https://greencleanschools.org/events/track/. We look forward to seeing you there! BRIDGEPORT, CT (June 21, 2017) – Unger’s Stingray Indoor Window Cleaning Tool, one of the company’s recent innovations in its portfolio of smart cleaning tools, has expanded the line of kits to include a new solution designed specifically for end users with heavy traffic and multiple glass touch points throughout facilities. The Unger Stingray cleans 25% faster and uses 39% less cleaning agent than traditional spray and cloth cleaning. The new kit includes enough cleaning solution to clean up to 16000 sq. ft. of glass and two window washing pads that make light work of grimy windows. This solution is ideal for educational and fitness facilities looking for a safe, more effective way to clean indoor windows and mirrors. Scotchgard™ Protection makes glass easier to clean over time. Minimized Airborne Chemicals – Pad design incorporates protective cut-out for precise liquid application reducing the chance of inhaling chemicals. Push Button Simplicity – Effortlessly apply glass cleaner at the push of a button at any height. 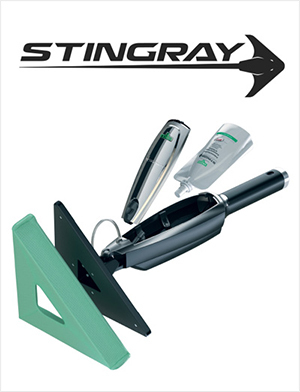 For more information on the Stingray Indoor Window Cleaning Kits, or to request an onsite demo, visit usa.ungerglobal.com. Founded in 1964 by Henry and Barbara Unger, for 50 years Unger has earned a reputation as a global leader in manufacturing professional cleaning and maintenance tools by developing and producing innovative, high quality, ergonomic products. Unger is the market share leader in window cleaning tools and have become the professional’s cleaning tool of choice in more than 80 countries through our commitment to providing the right tools for every task. 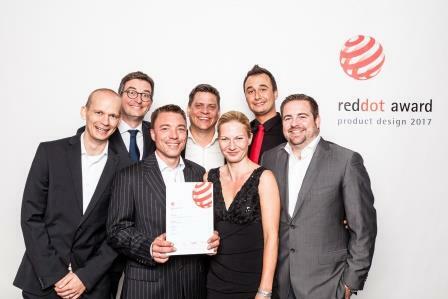 Solingen – The indoor cleaning system UNGER Stingray has received the internationally renowned Red Dot Design Award. 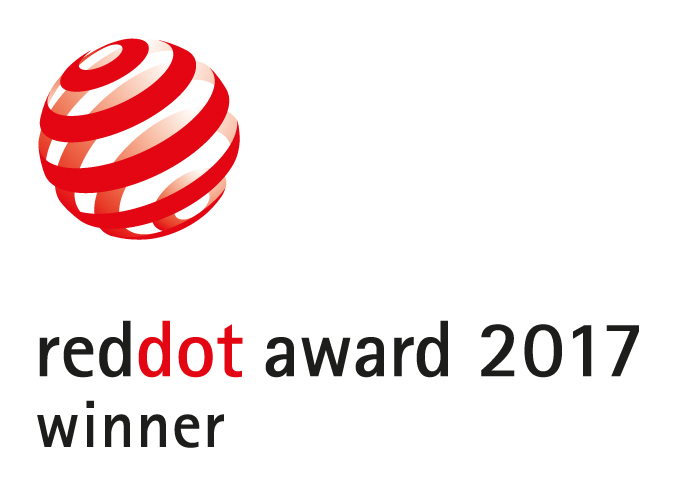 The expert jury selected the innovative product as the winner in the “Product Design” category from more than 5,500 entrants. 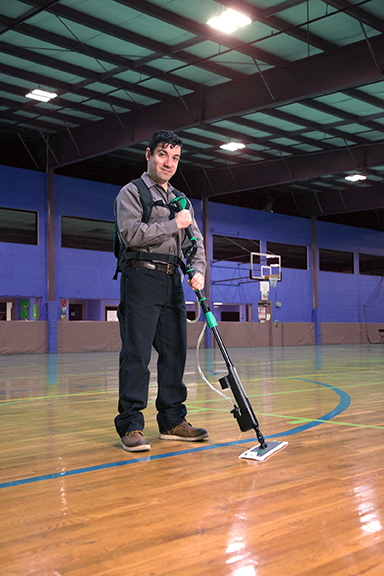 Bridgeport, Conn. January 4, 2016 – Unger Enterprises is proud to announce the launch of the Unger Stingray -The Ultimate Indoor Cleaning Tool. Time and cost management are important factors for any successful cleaning professional. When adding services like indoor glass maintenance to a cleaning routine it is critical to ensure the tools used enable a team to work quickly and efficiently.